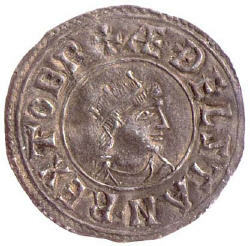 Athelstan claimed the title "king of all Britain". He took York from the Danes in 927 and forced the submission of King Constantine of Scotland and the northern kings. All five of the Welsh kings agreed to pay an annual tribute to him and he also eliminated opposition in Cornwall. Athelstan was the son of Edward and grandson of Alfred the Great, both of whom claimed the title "king of the Anglo-Saxons" (Anglorum Saxonum rex) and held court at Winchester. Relics such as the Sword of Constantine (Emperor of Rome) and the Lance of Charlemagne (first Holy Roman Emperor) came to Athelstan, according to William of Malmesbury. Athelstan enjoyed great fame in the Middle Ages, by conquering the pagan Vikings he captured the imagination as a Christian king and successor of Charlemagne and Constantine. A royal chancery produced a series of charters, law codes strengthened royal control and the weight of silver in coins was regulated. From the medieval period, stonemasons claimed a charter of Athelstan permitted them to hold an assembly. A version of this claim, written in the reign of Edward IV, was formerly in the possession of the famous Elias Ashmole, founder of the Museum at Oxford. "Though the ancient records of the Brotherhood in England were many of them destroyed or lost in wars of the Saxons and Danes, yet King Athelstan, the grandson of King Alfred the great, a mighty architect, the first anointed king of England, and who translated the Holy Bible into the Saxon tongue when he had brought the land into rest and peace, built many great works, and encouraged many Masons from France, who were appointed overseers thereof, and brought with them the charges and regulations of the Lodges, preserved since the Roman times; who also prevailed with the king to improve the constitution of the English Lodges according to the foreign model, and to increase the wages of working Masons. "The said King's brother, Prince Edwin, being taught Masonry, and taking upon him the charges of a Master Mason, for the love he had to the said craft, and the honourable principles whereon it is grounded, purchased a free charter of King Athelstane, for the Masons having a correction among themselves or a freedom and power to regulate themselves, to amend what might happen amiss, and to hold a yearly communication and general assembly. "Accordingly Prince Edwin summoned all the Masons in the realm to meet him in a congregation at York, who came and composed a general Lodge, of which he was Grand Master; and having brought with them all the writings and records extant, some in Greek, some in Latin, some in French, and other languages, from the contents thereof that assembly did frame the constitution and charges of an English Lodge, made a law to preserve and observe the same in all time coming, and ordained good pay for working Masons. Athelstan was buried in Malmesbury Abbey and was succeeded by his brother Edmund. Malmesbury was given royal borough status by Alfred the Great. From early Saxon times, the Benedictine abbey at Malmesbury was a centre of learning and a place of pilgrimage. The 12th century Abbey had a spire taller than that of Salisbury Cathedral. The town was of strategic importance during the English Civil War, being a strong defensive position on the road between Oxford and Bristol. Surrounded by rivers on three sides, this hilltop town with several freshwater springs is one of the best naturally-defended inland locations. In gratitude for their assistance in the struggle against the Danes, Athlelstan gave the King’s Heath to the Burgesses, their Heirs and Successors for ever, along with five hides (about 600 acres) of land to the south of the town. This status of freemen of Malmesbury was passed down through the generations. During the early Middle Ages, tradesmen and craftsmen coming into the town were made freemen of Malmesbury. Since the 17th century the right has been only handed down from father to son or son-in-law. A further charter was granted by Charles I in 1635, which was reaffirmed by William III in 1696. The Warden and Freemen Malmesbury sent two representatives to Edward I’s Long Parliament in 1295 and continued to send representatives to most of the subsequent parliaments until the Great Reform Act of 1832. Under the Municipal Corporations Act of 1882, a mayor, four aldermen and twelve councillors, administered the affairs of the borough. The Warden and Freemen of Malmesbury retain the lands granted by Athelstan and are trustees of several borough charities. Copyright © 2001-2012 The Fleece. All rights reserved.